We would also like to use this opportunity to thank Biafrans and IPOB members in Anambra, Rivers, Ebonyi, Abia and Imo states respectively for the overwhelming and immeasurable welcome they gave to our leader Mazi Nnamdi Kanu during his visit to the respective States. 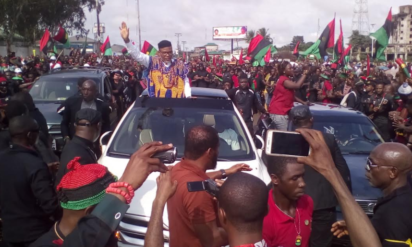 We equally thank God Almighty (Chukwu Okike Abiama) for making the outings and visits a successful one without any hiccups or breakdown of law and order despite the provocations of the Nigerian Army and Police in Ebonyi State. Those behind the evil plot to cause mayhem in Ebonyi State, with the sole intention of tarnishing the revered image of IPOB and our leader Mazi Nnamdi Kanu the prophet of our time, through their false media reportage, have failed woefully. They should tell their Hausa Fulani masters in Sokoto and Kaduna that the IPOB recovery exercise in Ebonyi was a successful one. Today Ebonyi State has regained it's lost status as the power house of the new Biafra resurgence. Since the inception of these private visits to various towns in Biafraland by our leader, we have not had any altercation, interruption or any act of misunderstanding between IPOB, the public and law enforcement agencies. At IPOB we make it a point of duty to stream live videos across the world of our movements and events, to prevent our enemies from instigating trouble with which they can use to justify their illegal arrests and mass murder. With the notable exception of Gov. Umahi's illegal and wholly unconstitutional road block on our way into and out of Ebonyi State, there has never been any recorded incident of police or army trying to impede our movement. Those that derive joy from peddling cheap lies and deliberate misinformation through certain media houses should hang their heads in shame. The fake fabricated report that there were interruptions or public displeasure at these events are pure lies. Anybody in doubt should watch the videos online. Those governors in the habit of paying journalists to write junk news about the movement of our leader are only doing so to serve the interest of their pay masters in the North. THE VOICE OF THE BIAFRAN RABBI.OH IPOB AND LEADERSHIP,WE THE 4.2MILLION ZIONISTS NEED ARMS NOW.WE NEED THE ARMS TO DO JUSTICE TO ALL THAT KILLED 3.5MILLION NDIGBO BETWEEN 67-7O.THE GAME IS A TRIANGULAR RING THAT WE SHALL FAITHFULLY SUBMIT 15MILLION SOULS TO THE NEW WORLD ORDER.IT WAS THE BRITISH THAT SUPPLIED ARMS TO KILL UMU-IGBO IN 67-70 AND THIS ZION GAME IS RIPPED AND ARMS IS NEEDED AND IS EXPECTED TO BE THROWN NOW IN LIKE MANNER DID IS LYBIA. WE ARE EARNESTLY ASKING FOR ARMS NOW TO DO JUSTICE IN NIGERIA AND TAKE BIAFRA-ZION STATE BY FORCE.#BIAFRA RISING#ZION RISING#ZOO MUST FALL#EVILS OF OTHMAN DAN FODIO MUST END#BIAFRAN REVELUTION REVOLUTION REVOLUTION!!! URS THE BIAFRAN RABBI.